Here’s an interesting question. When we have tens of millions of connected devices, how will we find the ones we need? Not in our homes, but when we’re wandering around town looking for highly local weather data or a specific road that happens to have sensors embedded in it? That’s the idea behind Thingful, a service built by a startup called Umbrellium. Thingful aims to create an index for the myriad connected devices that are hitting the market and our communities. In the same way that Google indexes web pages, Thingful aggregates and indexes objects worldwide providing direct links to datasets, datastreams or profile pages, with people at the very centre, by structuring their ownership around Twitter profiles. This makes it possible for people to talk about why and how they are using the devices that they add to the index. Thingful indexes across eight categories including health, environment, home, transport, energy and flora & fauna. These concepts have a basis in Pachube, which was like a data broker for connected devices years ago. It allowed devices to send their data up to the cloud where others could find and tap into that data. One of the most popular uses was after the Fukushima nuclear plant disaster, when people started sharing radiation information via Pachube. What’s exciting about Haque’s vision of the internet of things is that it’s about enabling users to have more information to be better citizens or to learn more about the world around them, as opposed to relying on connectivity to automate our lives and usher in an era of convenience where you never have to go to the grocery store because your smart fridge knows what you like and orders food for you. Thingful fits into this by letting people add their own devices and data to the service. So, if I wanted to, I could place a connected camera on my roof overlooking the common area behind my house and share that data with Thingful. Then I could pull that data from Thingful into an app that lets me share the stream with my neighbors. If they added cameras and shared their streams we’d effectively create a neighborhood watch. This is good for crime prevention, but also might be nice for tracking a lost pet or keeping an eye on your kids riding bikes around the neighborhood. 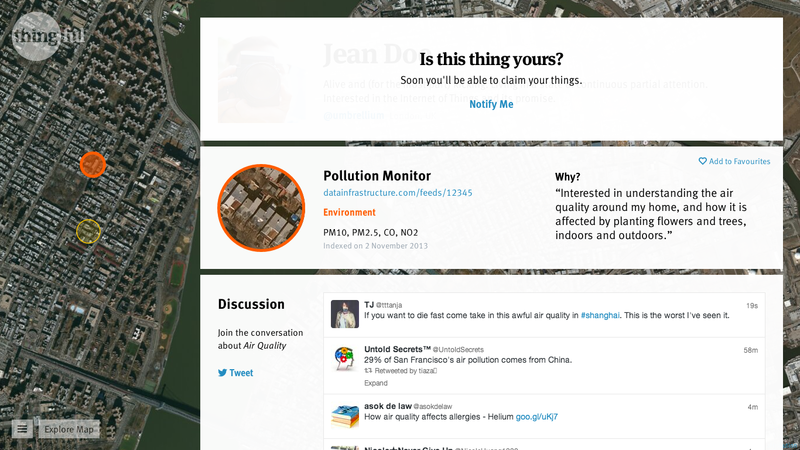 Other examples include creating an uber-local weather service or sharing air quality data. For more on this idea of the internet of things as a powerful enabler of curiosity and community, check out the video Haque did last February at our San Francisco internet of things meetup. It’s a refreshing change from using connected devices to target discounts or ads. Not everything has to be about consumption. Thingful launches in 2014 in beta with features that will let people register their own devices and get data on what people are using. Maybe we can get a sense of how many Nest thermostats have sold.